Teka, my dream-come-true Shih Tzu puppy, is my number 1 girl and the light of my life. She has lovely, fluid movement and great big eyes. She is a lot of dog in a solid compact package. She has good substance, great reach and drive, and was very easy to show. By the time she championed in both the US and Canada, she would just show herself as if I wasn’t even there, finishing in both countries in 1 season. She is a gold and white, but with a lot of dark color, and her show coat had a lot of red. She had an easy care coat,, quite smooth and of excellent texture. Her days are now spent being on my lap and not sharing me willingly with the others and.. whatever Teka wants, Teka gets. Allie is Coco’s Shih Tzu puppy littermate sister, and is a spitfire with a lot of attitude and energy. She is a smaller compact girl with big movement and a pretty face. She has amazing drive behind! She is a silver and white with black markings, which is quite nice to keep clean. Since she earned her championship, she spends her days making sure that everyone else in the house is doing what she thinks they should. She won a group 1 in Bred-by-Exhibitor competition along with several Best of Breeds, finishing her championship in May 2011 as we struggled to find majors that would hold. She is now cut-down and continuing her job as house manager. 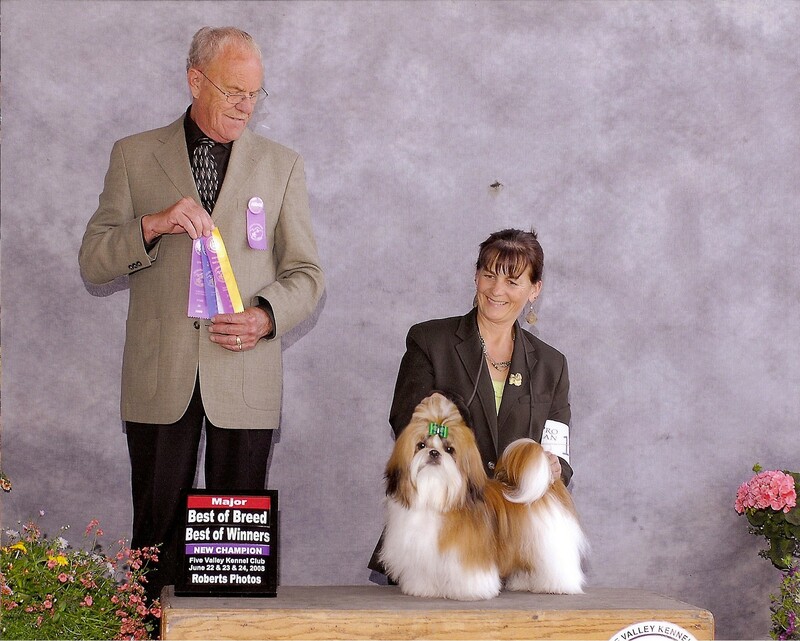 Cowboy, who really shined as a Shih Tzu puppy, finished his championship from the Bred-By class at 10 months with 3 majors, 2 group 1’s in Bred-By-Exhibitor, and several best-of-breeds after only showing a short time. He has a great temperment and was very outgoing in the ring. When he knew we were on the way to ringside, he would get very excited, which was great for attitude, but hard to keep combed. He is a very enthusiastic boy! 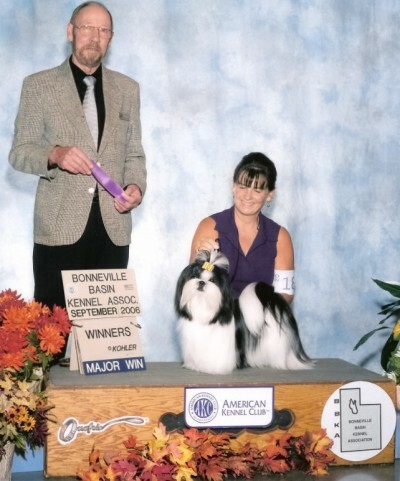 Cowboy is a red and white with nice black pigment and a large dark eye. He has beautiful long ground-covering movement with a level topline and no bounce at all. He has great kick and drive in the rear end, and excellent reach in the front. This boy can really move! He is the father of my girls, Scarlett and Brandy. Cowboy is now living in WY. I miss him so much. Click here to see more photos and pedigree of Cowboy. “Red”, a son of Cowboy and Keila, and the “pick” Shih Tzu puppy from that litter, is a conformation champion from the Bred-By class, finishing his championship with 2 five point majors/ best of winners as well as a group 2 in Bred-By. He is a pretty mover with a long stride and good reach and kick, very upheaded. He has a very outgoing personality. Red is now enjoying being the center of attention and love with his “forever” family, but I still get to see him. Keila, Red’s mother, is a gold and white, very sweet, feminine girl, with a gentle nature. She has huge dark eyes, great pigment, and a lovely bite. She championed in both the US and Canada, and after her last win, I kept her in the ring to hold a major, and had a young girl show her. She was not suppose to win, but Keila had other ideas, and self-showed, almost winning again. The judge was quite taken-in by her, and she worried us by going reserve, almost taking the major that day as well. 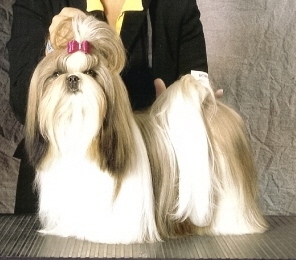 She has a lot of charm in her demeaner, and has been melting hearts since she was a Shih Tzu puppy. She has a habit of standing in place and dancing her feet while talking to me when she wants something. It usually works too! Keila no longer lives with me, but wass the center of her new family’s love and attention, and because she lived close, I still got to see her often, which I loved! She has now passed away…such a sweet, sweet girl. 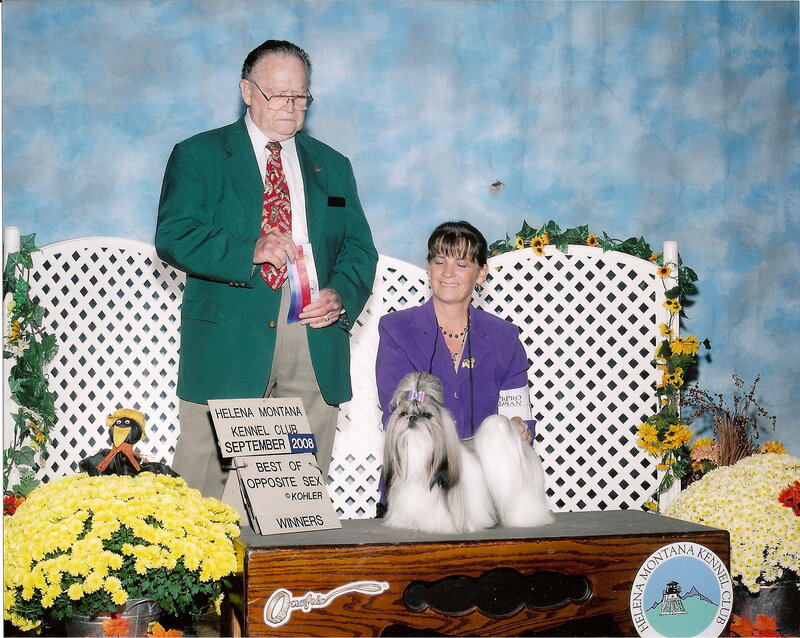 Anna is a clear black and white who was an amazing Shih Tzu puppy. She championed quickly in both the United States and Canada. 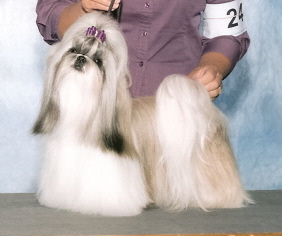 Her wins included a Best Puppy-in-Show in Canada at 10 months of age, her 2nd weekend out and a Best Puppy in Sweeps beating 80 other puppies. 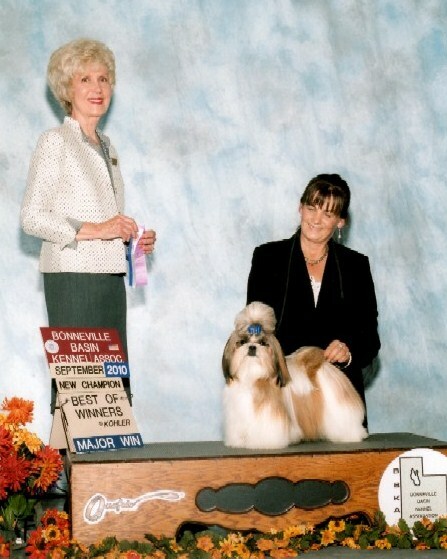 She also had a group 2 and a group 3 in all-breed competition in the US. I especially enjoyed this as I was the only owner/handler in the line-up. She is a very balanced mover with “big” movement, long and free, and a level, smooth topline. She is outgoing, affectionate, and loves to play with her toys. Anna now lives about 2 hours from me where she is the princess of her home, tho it was extremely difficult for me to let her go to a new home, but she is very happy. Anna passed away in early 2018. How I miss her….